Just in time for St. Patrick's Day. A beautiful green broccoli soup. Veggies tend to build up in our refrigerator. With the very best of intentions, we subscribe to a CSA produce box that arrives every other week. In the off weeks, we wander over to the Sunday farmer’s market to supplement. Certain that we will gorge ourselves on fresh produce, we accumulate food we know we should be eating. Once in a while we fall out of cycle because of meals out or travel and all our good intentions catch up with us. We recently received a beautiful head of broccoli in our farm box that, after a week in the fridge, needed attention before it faded and became compost. Jason recommended soup and since we had a fresh batch of chicken stock on hand, it was the perfect solution. Mind you, the chicken stock was made from the leftover bones and carcass of a roasted chicken from Limon Rotisserie which means the resultant stock was ultra savory. But while the Limon bones aren’t something everyone has access to, you can make extra savory soup broths by simmering lots of aromatic vegetables, fresh and dry herbs and plenty of spices. With just the right amount of sea salt, a decent broth can be made extraordinary. So, the leftover broth went into a soup pot where it was brought to a simmer on the stove. Once hot, we added the broccoli stems to cook before adding the florets which can lose their color if cooked too long. With this soup, we let the stock and stems cook down to concentrate the flavors. In went the florets and a little water before covering the pot to bring it back up to temperature. The broccoli needed to cook long enough to become tender without turning khaki. It probably took about 10 minutes for it to soften enough before going into a blender where it was pureed until smooth. My first instinct was to strain the puree through a fine mesh sieve, but I wasn’t happy with the consistency of the watery soup it produced so I added the pulp back to the pan along with the liquid. The puree was fine enough that there were no unpleasant fibers in the finished soup so why waste the nutrient dense broccoli? While tasty, the soup seemed to be missing something and for a minute I considered adding vinegar or lemon juice, both of which would have been fine, but it wasn’t what I was looking for. Then it hit me – BUTTER! Not just any fat would do. Extra virgin olive oil would certainly add flavor, but it was the wrong flavor for this delicate vegetable soup. No, this needed what any good professional kitchen would consider indispensable and that’s plenty of sweet, unsalted butter. So, back into the blender the soup went. Still steaming hot I separated it into two batches and then blended each with two tablespoons of butter. The finished soup was velvety and rich without being oily. It was perfect! Bring the stock to a boil and add the stems of the broccoli. Cook for about 10 minutes than add the florets. Cook for another 10 minutes. Transfer ½, or so, of the soup to a blender and puree until very smooth. Add two tablespoons of cold butter and continue to puree for another minute. Transfer to a new pot and do the same with the remaining broccoli and stock. Warm the soup slightly before serving. That sounds wonderful, simple and healthy. I had to laugh over your dilemma to strain or not to strain as I have made dental floss soup. It can get fibrous but adding the stems first is good advice, or to peel the stems works as well. A french version would be to strain seven times, add cream and four tablespoons of butter and take 3 hours to eat over a bottle of wine. This soup is a lovely tribute for St Patrick’s day…the idea of adding butter is interesting and one I must try. 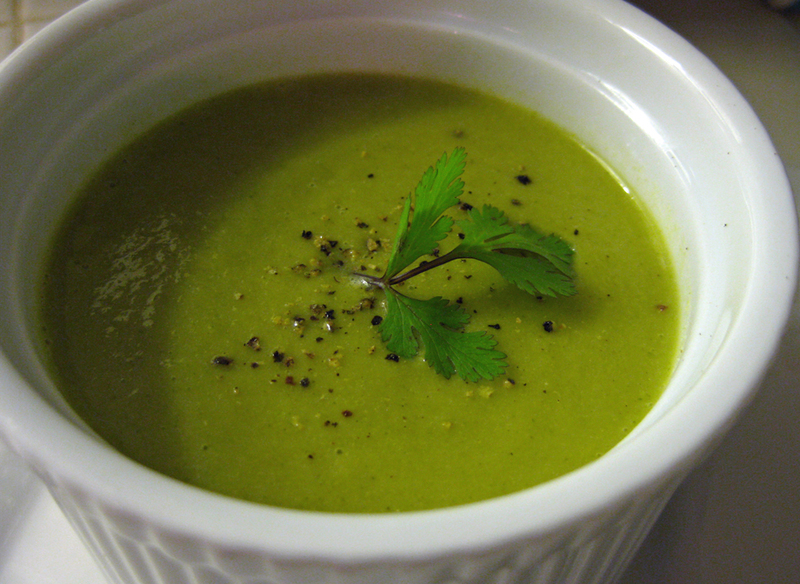 I often make this soup but add peas and spinach for that extra “green” colour! Thank you for the kind note, Peter! Your blog is an inspiration – the food and the photography – and we hope our readers pay it a visit often. This looks wonderful! We always get a deluge of broccoli all summer long, so I am looking forward to making this.